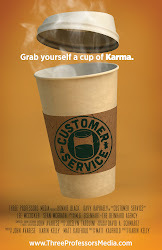 Customer Service is an official selection of the Pittsburgh Independent Film Festival! It'll be screening Sunday, June 16th, during the 1:45 block. If you're in the three rivers area, stop by and see a whole bunch of great short films and meet writer and producer Matt Kaufhold at the Q&A afterwards.